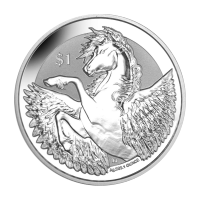 1 oz 2018 British Virgin Islands Pegasus Silver Coin | ?? 正面 Portrait of Queen Elizabeth II. 反面 Pegasus with its wings spread.